This weekend I really didn't want to be tied down to a certain theme. So I thought I would have an Anything Goes weekend. Anything I feel like watching is fair game. Don't even have to be on DVD. Could be on DVD, TV, Premium Cable, On-Demand or movies I have on my computer hard drive. But that being said... I do want to get my unwatched DVD pile down a bit. As of the start of this marathon I have 134 movies on DVD that I haven't watched yet. At least not since I bought the DVD. One of these days you need to have a John Wayne War Film Marathon. You certainly have enough movies to have such a marathon! If that is viable to you, you would probably want to hold off watching any of those in the meantime. I have no real suggestions unless you want to fit in a western. You have One Eyed Jacks...which is actually one western I have never seen myself. I actually was considering something like that this weekend Roger... but with Britt being off for Easter vacation (and not visiting her grandmother) I wanted something more open so we could watch at least a few together. I don't know what is wrong with me here the last couple days. I just can't seem to find something I am in the mood to watch. It is like I am trying to force myself to watch a movie. And it isn't working out too well. Well... lets see if I can get myself to do anything today. Featuring cameos by Paul Reiser, Bronson Pinchot and Damon Wayans, Beverly Hills Cop is an exhilarating sidesplitting adventure! Jimmy... I just used my review from the last time I watched this movie. But this one is much more detailed... so you can just point the link to the above review. The heat's back on! 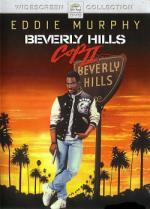 And Eddie Murphy is cool as ever in this sizzling, smash-hit sequel to Beverly Hills Cop. Axel Foley (Murphy) is back – back where he doesn't belong! He's going "deep, deep, deep undercover" into the chic wilds of Southern California, unleashing his arsenal of blazing gunfire and rapid-fire gags against a gang of international munitions smugglers. Back, too, are Judge Reinhold and John Ashton as Murphy's crime-busting sidekicks. And Top Gun's director Tony Scott keeps the pace fast, furious and funny. This is a nice continuation to the series. One I enjoyed very much. Though it isn't quite as good as the first one. I must admit I did like the chase scene using the cement mixer. Especially when Axel asks if the "steering works on this thing"... Rosewood comes back with "I'm Steering!" then Axel asks if the "Breaks work on this thing?"... and Rosewood says.. "I don't Know... I haven't tried them yet!" But this one once again has some good action and some decent laughs... I definitely recommend it. Axel Foley (Eddie Murphy) journeys back to Beverly Hills for a real roller coaster thrill ride at the Wonderworld amusement park! Joined by old pals Billy Rosewood (Judge Reinhold) and Serge (Bronson Pinchot), Axel becomes the hottest new attraction as he chases down the bad guys on the rides, through the shows and in the underground maze beneath the park. Beverly Hills Cop III is a "wild, funny action comedy"* that will have you hooked for the whole ride! While still entertaining... I this is my least favorite of the three movies. It is still worth watching every once in a while... but I didn't care too much for the storyline. The jokes they are using seemed recycled from the previous movies. But it still has a few decent laughs. The action isn't quite as good in this one either... but there is still some to enjoy. But watching this one you can tell why it is the last one in the series. I must admit... I thought I remembered this one being better then what it actually is. This one really is no more then juvenile jokes and other ignorant moments. I watched this one expecting at least a few laughs... but I didn't laugh at all through out this entire movie. Was there anything good about this movie... any type of saving grace? Well there is Bridgette Wilson who plays Veronica... if nothing else she was worth looking at! I think what I need to do when it comes to Adam Sandler movies is stick to the newer ones... and forget he even made some of these older.... more slapstick and juvenile movies. It has been a long time since I saw this movie and I don't remember it being that bad. I thought the same thing before I popped it in. But I was shocked at how bad it was to me this time. More then once I almost turned it off. Connor Mead is the kind of guy who dumps three girlfriends. At the same time. By teleconferance. So when he attends his brother's wedding he has a single goal: score with the only bridesmaid he somehow missed. But the ghost of his departed Uncle Wayne - who taught him to love 'em and leave 'em - has another goal in mind: restore Connor's lost faith in true love, a tough assignment requiring the services of many, many Ghosts of Girlfriends Past. Matthew McConaughey, Jennifer Garner and Michael Douglas and director Mark Waters (Mean Girls, Just Like Heaven) uncork a romantic romp as bubbly as wedding-toast champagne. It's the perfect comedy for anyone who believes in laughs and love. Or needs to. This one I watched on HBO On-Demand. I wanted to check this one out because I always liked Jennifer Garner. While I really enjoyed Jennifer Garner in this movie. I did leave it a little disappointed. There really wasn't to much comedy here. And while I liked the idea of making it basically a rip-off of A Christmas Carol... I really didn't care for who they picked for the ghosts. at least not for the present and future. I did kinda got a kick out of Uncle Wayne... and the Ghost of Christmas past did give me a couple quick chuckles. But over all I just found it to be an average Romantic Comedy. If I do add this one to my DVD collection (if for no other reason then Jennifer Garner) it will be because I found it right cheap. Thinking right around $5 and I MAY grab it. This one I watched on Cinemax On-Demand. While an entertaining little popcorn flick... I wasn't as impressed as I thought I would be with this one. Maybe if I could actually see it in 3D it would have been better. As it looks like it could have had a lot of good 3D effects. I would say for me this one was a little above average. And I would add it to my collection if I found it cheap enough. But I wouldn't pay much for it. Maybe if I could actually see it in 3D it would have been better. As it looks like it could have had a lot of good 3D effects. Especially since you point out "3D effects", it's clearly gimmick only.